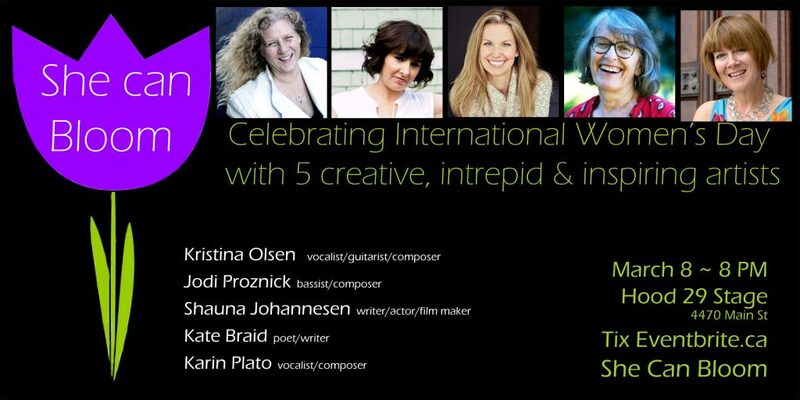 I am absolutely thrilled and honoured that these extraordinary women have agreed to perform for the ‘She Can Bloom’ project. These are women I have watched and listened to, have been inspired and deeply moved by. I have cried, I have laughed, I have cheered for these talented artists. I have read the poems, books and songs that they have written. I have watched their films and plays. I have listened to their recordings and in some cases I have been able to share the stage with them. Now, the Vancouver audience will be able to attend an evening featuring each of these creative women in celebration of International Women’s Day. Born in San Francisco and raised in Haight-Asbury during the 1960’s, Kristina Olsen’s approach to music and life was formed by that environment of vital cultural expression, social activism and diverse musical influences. She now calls Venice Beach, Los Angeles home but rarely sees it from touring ten months a year. She is a contemporary folk singer-songwriter and multi-instrumentalist known for her sometimes humorous, heartfelt and sometimes ribald songs. Many of her recordings appear on Rounder Records. “It is indeed a rare occurrence to be so completely captivated for an entire concert by one person and a guitar, but American singer/songwriter Kristina Olsen certainly managed this and more, delivering a highly entertaining show to a capacity audience for over two hours. From her opening songs I felt that this was a person I had known for much longer, the supreme accolade any storyteller can wish for. The audience of predominantly forty-somethings loved it, demanding that Olsen return to the stage for three encores. Juno-nominated bassist, composer, producer and educator Jodi Proznick has earned a reputation as one of Canada’s finest jazz artists. She has won numerous National Jazz Awards, including Bassist of the Year in ’08 and ’09. Her group, the Jodi Proznick Quartet, was awarded the Acoustic Group of the Year and Album of the Year in ‘08 and the Galaxie Rising Star at the Vancouver International Jazz Festival in ‘04. As well as an extensive background as a jazz educator, Jodi was involved in teaching early childhood music classes for over 15 years. Her methodology included a combination of Orff, Kodaly, Dalcroze, Montessori and Suzuki philosophies of music education. Her areas of interest include arts-based research, embodied educational practices, attachment, phenomenology and creativity. Originally from Edmonton, Shauna is an award-winning writer, actor and filmmaker. Her plays have been produced across Western Canada and the short film “Bedbugs: A Musical Love Story,” which she wrote and starred in, garnered numerous accolades on the festival circuit, including three Leos. Shauna’s newest play “Common Grace” is now in development to become her first feature with Jenkinson/Goode Productions (NUMB). Her current short film, “Trying,” Shauna’s directorial debut, has already elicited multiple Leo nominations and won Shauna the Matrix Award for Outstanding BC Short Film and the WIFTV Spotlight Image Award. Shauna has a BA in English and Theatre from Calvin College as well as an MA in English Language and Culture from the Vrije Universiteit. She comes from a family of six kids and has lived in Michigan, Honduras, Amsterdam, and Kenya before settling in Vancouver, Canada. In 2015 Kate was given the Vancouver Mayor’s Award for the Literary Arts, “for having made a significant contribution to the discipline and for showing leadership and support for Vancouver’s cultural community over the course of her career. Kate Braid was one of the first qualified women carpenters in British Columbia, the first woman to join the Vancouver local of the Carpenters’ Union, the first to teach construction full-time at the BC Institute of Technology and one of the first women to run her own construction company. Though she loved the work, it was not an easy career choice but slowly she carved a role for herself, asking first herself, then those who would challenge her, why shouldn’t a woman be a carpenter? In her book ‘Journeywoman” Kate Braid tells the story of how she learned the carpentry trade in the face of skepticism and discouragement. Karin Plato is a Canadian Juno nominated Jazz vocalist and recording artist. She has performed throughout Canada and in the western USA for concert societies and at jazz festivals. She works as a composer, arranger, music educator, concert producer, and is the artistic director of the JOY OF JAZZ CONCERTS series in Vancouver BC. She has three times been nominated Canadian Jazz Vocalist of the Year at the National Jazz Awards and she is a West Coast Music Award nominee. Karin’s latest recording “This Could Be The One” features several original songs as well as a few arrangements of a few other songs to feature her Vancouver based quintet. ** The ‘She Can Bloom’ performance begins at 8:00 PM and it is advised that attendees arrive by 7:00 PM if they plan on having dinner at Hood 29 in advance of the show. Food and drink will be also be served during the intermission. Hood 29 features an intimate atmosphere ideal for this inaugural performance event in Vancouver. Hood 29 serves an array of delicious food and drink with a down to earth warmth and friendly appeal.